For many, writing a screenplay can be like waging a war. It’s you vs. the blank page. Pilar’s book is like a strategic field guide about the art of war, so read it and keep it handy the next time you type FADE IN. I’m loving your book! I am using the character section as we speak. And I’m filming my feature directorial debut in April from a script I wrote! I never write a story—screenplay or prose—without my dog-eared copy of Pilar’s The Coffee Break Screenwriter by my side. It’s the craft book I recommend to my peers and students. The Coffee Break Screenwriter is not another cookie-cutter craft book with rules about what happens on pages 10, 25 , 60, etc. Rather, it offers an organic approach to crafting a fresh, original story with well-developed characters and a compelling plot. It’s the only screenwriting book a writer needs. I ran across your book by accident and bought it on a lark. It was wonderful! I had the outline of my story done within just a few days. I completed two thirds of my screenplay in just a few weeks. The middle third took some retooling, but your book helped me stay focused and gave me the encouragement that I could complete my work without going to an expensive film school. I’m a London-based 9-to-5er and new Dad who has found your Coffee Break Screenwriter method very useful in maintaining my productivity throughout my recent lifestyle changes. This is an exciting discovery! I’m reading The Coffee Break Screenwriter right now, and I’m enjoying both the author’s perspective and problem-solving techniques. I’m going through the Take-Ten’s to help pinpoint some problem areas in a script I wrote a few years ago. I look forward to hearing the podcasts! Of all the books I have read recently on screen-writing yours was the best investment I made. Thank you for the book and the podcast. Both have been very useful to me as a theatre writer in the UK. In fact I have used the Coffee Break screenwriter to help me structure a play I am writing for York Theatre Royal. Love your book! I actually feel like I can write a winning story now. I was really struggling getting started on my first screenplay. I had all these great ideas in my head, I just didn’t know how to put them on paper. The Coffee Break Screenwriter was a huge help. The step by step process detailed in the book makes it so simple. Using these guidelines I was able to finish my first screenplay in four months, while working my 55 hour a week day job. Three production companies are already reading my script. Thanks Pilar! My copy of The Coffee Break Screenwriter arrived in the mail today. I’m barely 9 pages into the book and it’s already helped me immensely. I have been frustrated and struggling to break the story on a horror/comedy feature I want to write. For over a year I’ve been spinning my wheels on it without going anywhere. When I read the section “Secondary Characters Tell The Story” the answer hit me like a ton of bricks. I had the wrong protagonist!If the rest of this book is as insightful as the first 9 pages (and I imagine it is), then I fully expect to be hit by a lot more bricks in the near future. I should probably invest in a helmet. The Coffee Break Screenwriter celebrates the time-tested adage that any large job can be made easier by breaking it down into manageable chunks. Everyone has 10 minutes to spare, and this book maximizes that time with a treasure trove of clever tips and exercises guaranteed to improve your script. There are so many great lessons for writers of all skill levels — from beginner concepts like story beats, to more advanced rewriting and pitching techniques, to practical advice from working screenwriters. It’s quite possibly the most complete step-by-step system for taking a screenplay from rough concept to polished final draft that I’ve ever seen. I wish I could have read this book years ago. It would have saved me months of false starts, writer’s block, flat characters and just plain bad writing. The Coffee Break Screenwriter is a collection of lessons that will hone your craft and turn you from a hobbyist into an authority. It’s a definitive and deceptively simple book that has boiled out all of the irrelevant minutia and pretense and bites deep into the bone of what makes a screen play work. I loved The Coffee Break Screenwriter! For many writers, facing the prospect of writing a feature-length screenplay is formidable and sometimes unnerving. Pilar Alessandra breaks the task into short, sensible bites, and before you know it you’ve conceptualized and written the entire draft — with or without coffee! With The Coffee Break Screenwriter, Pilar Alessandra has demolished a writer’s most cherished excuse — now you can never say you don’t have time to write! Get the book and get to work! This is the book I needed when I first moved out to Hollywood -— a nuts and bolts approach to scriptwriting and the world around it, told in a matter-of-fact, no-nonsense style. It will take you from talking about writing a screenplay to actually doing it. The Coffee Break Screenwriter is an asset for both producers and screen- writers. It provides clarity on story and structure, works for developing characters, and is a great help on any project. Awesomely inspiring! Through her book, Pilar is your mentor, your muse, and your time keeper. She takes you right into your story every time, making the most of all those precious writing moments of yours, and proves that you can — or rather, must — balance organization with creativity to really succeed as a writer. This is a unique and highly useful guidebook that provides valuable practi- cal advice for both the aspiring and working screenwriter. While it’s true that ‘writing is easy but thinking is hard,’ Pilar has made the ‘thinking’ part that much easier. 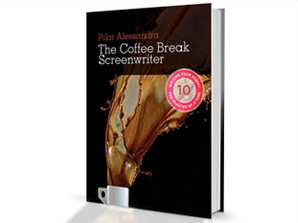 In the already crowded field of ‘how to’ books promising to help neophyte writer’s create the next eleven figure screenplay sale, Pilar Alessandra’s – The Coffee Break Screenwriter – is a refreshingly honest and insightful standout. Moving past bland recycling of familiar screen craft truisms, Ms. Alessandra offers her readers a shrewd insider’s view of what makes a good screenplay sing. Those who wish to follow her book in a step by step fashion will be rewarded with an easy to grasp, elegantly organized progression of sections designed to steer the writer toward a rich, sparkling, character driven screenplay. More experienced writers are free to pick and choose from a broad palette of techniques Pilar has designed to attack specific writing challenges. Most helpful of all, however, is Ms. Alessandra’s overall approach– she encourages writers to take brief pauses from their busy lives, work in quick, efficient bursts, until the seemingly unvanquishable Goliath of a finished script has been felled by a hundred surgically hurled stones. Scott Marshall Smith, Writer of Men of Honor, Upcoming installment of The Thomas Crown Affair, sequel to The Score and remake of The Star Chamber. Anyone who’s listened to her podcast or taken her class will tell you — Pilar knows screenwriting. At last here’s the book we’ve been waiting for! If you don’t live in L.A., it’s the next best thing to having Pilar give you notes while you write. As close as you can get to taking a screenwriting class. Unlike any other screenwriting how-to book, The Coffee Break Screenwriter is structured around Pilar’s ‘10 Minutes at a Time’ approach, and concisely breaks down the development process used at studios to create scripts. This book will help the screenwriter accomplish more in less time — an especially critical skill today when we would like to pack more into one minute of time than ever before. For busy people juggling career and a home life and putting off writing a script — you have no more excuses. This is the help you’ve been waiting for! Pilar brings amazing passion and technical skill to prepare writers for a pro- fessional career. I have been bringing her in to work with our writers in the Disney ABC Writing Program for years and have seen her methods in action. With Pilar’s help, writers brainstorm on the spot, prepare outlines efficiently, and learn to deliver pages under tight deadlines. Now through this important book, she brings her unique writing tools and techniques to everyone. The Coffee Break Screenwriter reads like a workbook on how to actually get that script you started writing, finished. Most of us are very busy in our days. We want to write, but when to find the time? Here’s your answer. You only need to find 10 minutes. Organized with quick 10 minute exercises, Pilar Alessandra’s book will help you to stay on track, not get overwhelmed, and most importantly finish what you started. With 11 chapters, from developing story to creating opportunities to get your work read, this is a must read book for aspiring screenwriters. The lessons here don’t have to stop with screenwriters though – any writer will find some of these tips useful to strengthen their stories. I know you’re busy, but don’t let it’s 262 pages deter you. Because of it’s format, this book has (to use a term scriptreaders often apply to scripts) a lot of ‘white space.’ The paragraphs are short and concise, getting the point across without making it hard to sit down and read for any length of time. As a writer, I would definitely recommend getting this book. It is one of the clearest scriptwriting books out there. If you’ve been dying to write a screenplay, but are intimidated and overwhelmed at the “HOW” of it all, then this truly is the book for you. The genius of Pilar’s approach is how she demystifies the writing process and breaks it down into easily digestible ten-minute chunks. You’ll be inspired by her brilliant insights, and encouraged by her straightforward guidance – and if you keep with it you’ll find yourself staring at your finished screenplay, wondering why you were ever intimidated in the first place.